Members of the Taiwan Cathay General Hospital’s medical mobile service team examines a patient’s ear. The Taiwan Cathay General Hospital Medical Mobile Service team treated about 1000 patients during their visit to Fiji last week. Cathay General Hospital Professor and chief Otolaryngology Dr Pa-Chun Wang said the team returned to Taiwan last Thursday. They spent two days in Suva screening Yat Sen Primary School and Marist Brothers High School students before spending six days at the Sigatoka Hospital screening and treating patients in the West. The team consisted of four doctors in ear, nose and throat (ENT), a cardiologist, two nurses and a pharmacist. 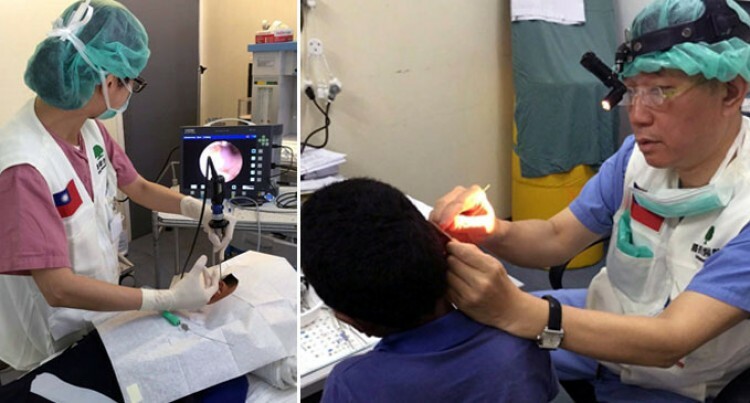 “It is a worthy note that the ENT doctors brought sophisticated STORZ endoscopic equipment and performed 18 endoscopic ear surgeries for patients with middle ear infection. The treatment is believed to be the first time in Fiji,” Dr Wang said. He said the cardiologist also brought a sophisticated portable heart echo machine that helped local doctors to diagnose many suspected cardiac diseases. “We intend to establish a long-term service model in this area for the continuation of care for the local people,” he said.